I argued last year that leftists should be nice to rich people because upper-income taxpayers finance the vast majority of the American welfare state according to government data. Needless to say, my comment about being “nice” was somewhat sarcastic. But I was making a serious point about the United States having a very “progressive” fiscal system. The top-20 percent basically pay for government and those in the bottom half are net recipients of that involuntary largesse. I also pointed out a huge difference between the United States and Europe. Governments on the other side of the Atlantic impose much higher burdens on lower-income and middle-class taxpayers. Here’s some of what I wrote. 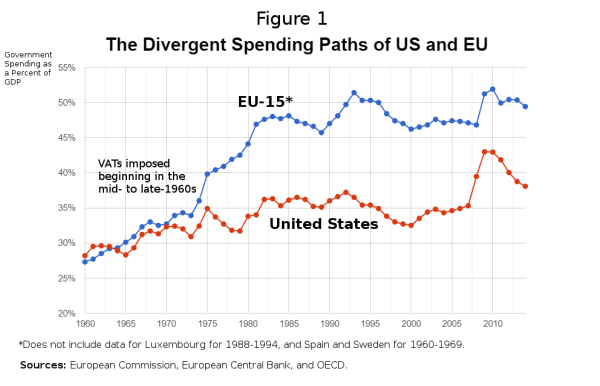 …the big difference between the United States and Europe is not taxes on the rich. We both impose similar tax burden on high-income taxpayers, though Europeans are more likely to collect revenue from the rich with higher income tax rates and the U.S. gets a greater share of revenue from upper-income taxpayers with double taxation on interest, dividends, and capital gains (we also have a very punitive corporate tax system, though it doesn’t collect that much revenue). The real difference between America and Europe is that America has a far lower tax burden on lower- and middle-income taxpayers. Tax rates in Europe, particularly the top rate, tend to take effect at much lower levels of income. 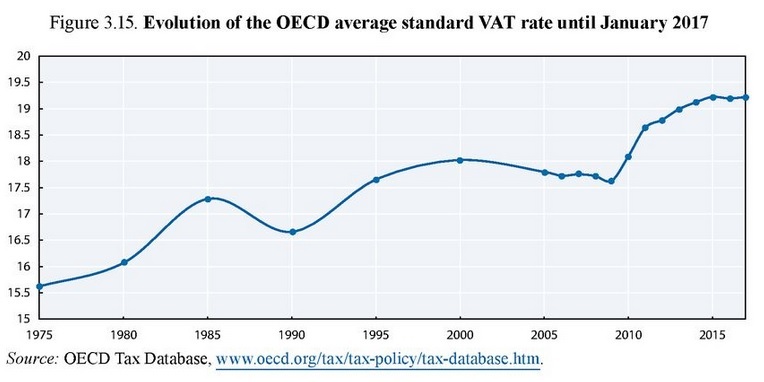 European governments all levy onerous value-added taxes that raise costs for all consumers. Payroll tax burdens in many European nations are significantly higher than in the United States. So do this mean European politician don’t like ordinary people? I could make a snarky comment about the attitudes of the political elite, but I’ll resist that temptation and instead point out that taxes in Europe are much higher for the simple reason that government is much bigger and that means some segment of the population has to surrender more of its income. But here’s the $64,000 question that we want to investigate today: Why are European governments pillaging lower-income and middle-class taxpayers instead of going after the “evil rich” and “greedy corporations”? Part of the answer is that there aren’t enough rich people to finance big government. But the most important factor is the Laffer Curve. Politicians can impose higher tax rates on upper-income taxpayers and companies, but that doesn’t necessarily translate into higher revenue. Simply stated, well-to-do taxpayers have considerable ability to earn less income and/or report less income when tax burdens increase, and they do the opposite when tax burdens decrease. That’s true in the United States, and it’s true in European countries such as Sweden, France, Russia, Denmark, and the United Kingdom. So even if politicians want to fleece upper-income taxpayers, that’s not a successful method of generating a lot of revenue. Which is why a shift from a medium-sized welfare state (such as what exists in the United States) to a large-sized welfare state (common in Europe) means huge tax increases on ordinary taxpayers. I’ve made this point before, but now I have some additional evidence thanks to a new report from the Organization for Economic Cooperation and Development. The Paris-based bureaucracy is probably my least-favorite international organization because of its advocacy for statism, but it collects and publishes lots of useful statistics about fiscal policy in the industrialized world. 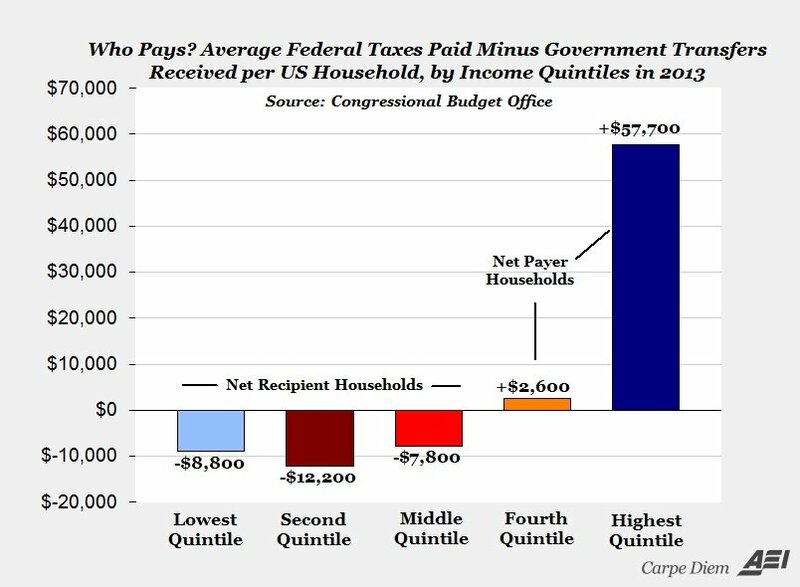 And here are three charts from the new study that tell a very persuasive story (and a depressing story for ordinary taxpayers). First, we can see how the average tax burden has increased substantially over the past 50 years. And who is paying all that additional money to politicians? 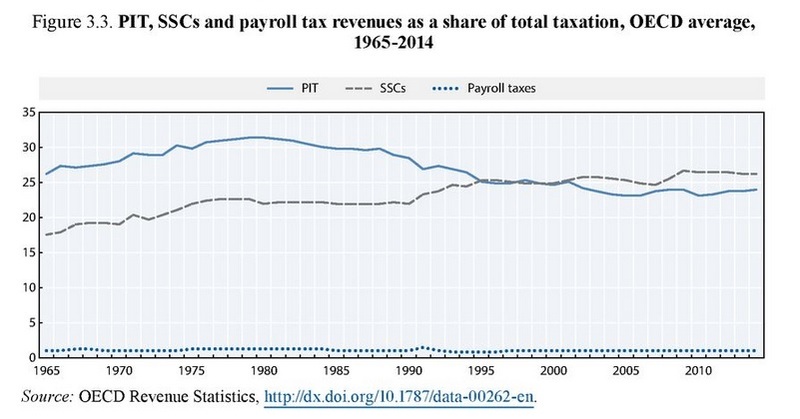 As you can see from this second chart, income tax revenues have become a less-important source of revenue over time while social insurance taxes (mostly paid by lower-income and middle-class taxpayers) have become a more-important source of revenue. 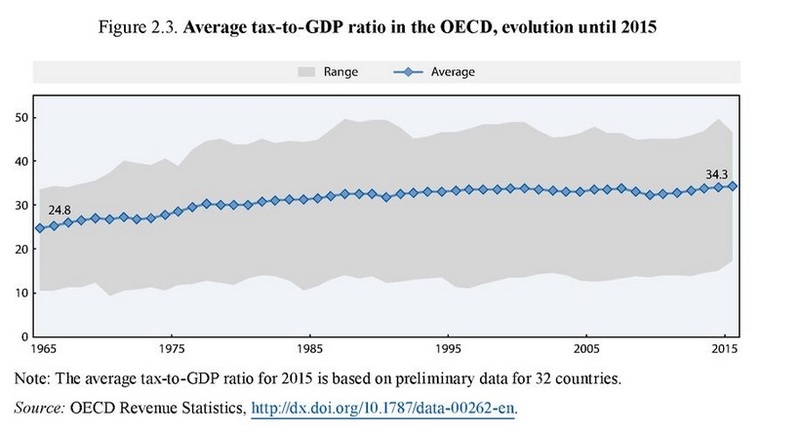 The third chart shows the evolution of the value-added tax burden. This levy takes a big bite out of the paychecks of ordinary people and the rate keeps climbing over time (and if we looked just at European governments that are part of the OECD, the numbers are even more depressing). Now let’s put this data in context. The United States now has a medium-sized welfare state financed mostly by upper-income taxpayers. But because of dramatic demographic changes, we are doomed to have a large-sized welfare state. At least that’s what will happen if we don’t reform entitlement programs. And if we leave policy on auto-pilot and there’s a substantial increase in the burden of government spending, it’s simply a matter of time before politicians figure out new ways of taking more money from lower-income and middle-class taxpayers. Yes, they may also impose higher rates on “rich” taxpayers, but that will be mostly for symbolic purposes since those levies won’t generate substantial revenue. Last but not least, don’t forget that European fiscal burdens will mean anemic European economic performance. Like you, I am a huge fan of growth. It is crucial to future prosperity. This post (link below) is for you. I may not do it full justice (I try not to exceed 1,000 words), but I’m sure you will agree with the tone. Feel free to leave comments with any other good arguments in favor of growth. We are in an “age of acceleration”, where technology is moving faster than society’s ability to adapt. While people out in the free market are having trouble, government (legislators, the Fed) slogs along not feeling the pressures coming from exponential growth, because the nature of government is that it has nothing like the profit motive to indicate that it’s moving in the wrong direction or what has worked in the past has stopped working. The US has an advantage over other countries, because of our free market and risk taking history. But, we seem to be throwing that away, just when we should be running lean and ready to adapt to new paradigms. Many react by hunkering down, but we’ve got to be pro-active. I’ve been a big fan of a UBI, because it will give everyone a level of security in an insecure world, and because I see it as a tool for passing a 21st century flat tax/safety-net package, that will allow people to take chances and adapt. For many people higher taxes are a reasonable compromise for a more generous welfare state. A little better, a little worse, for most people it’s about the same, so they won’t scream too much when politicians start taking more of their money in exchange for more benefits. Where all people will be drastically hurt though in the longer term is the last phrase in the post. GROWTH. The welfare vs taxation decision is a debate about a fixed factor. Growth, on the other hand is an EXPONENT. Over the mid to long term the exponent always wins over the fixed factors in determining prosperity. And it continues to win thereafter, exponentially! So the suicidal voter-lemming decision is to take a dollar of welfare now (and actually having to pay for it from his other pocket) versus five perpetual exponentially growing dollars in the future. It’s the classic sort term vs long term compromise which most people get wrong, because they cannot resist. It is this short sighted dash for a quick immediate reward over the many times multiplied future reward that dooms a democracy whose citizens having lost the religious ethics of self reliance have taken up an affinity towards coercive collectivism. PS. I’m not religious myself. But I understand the power of exponents dwarfing fixed factors.